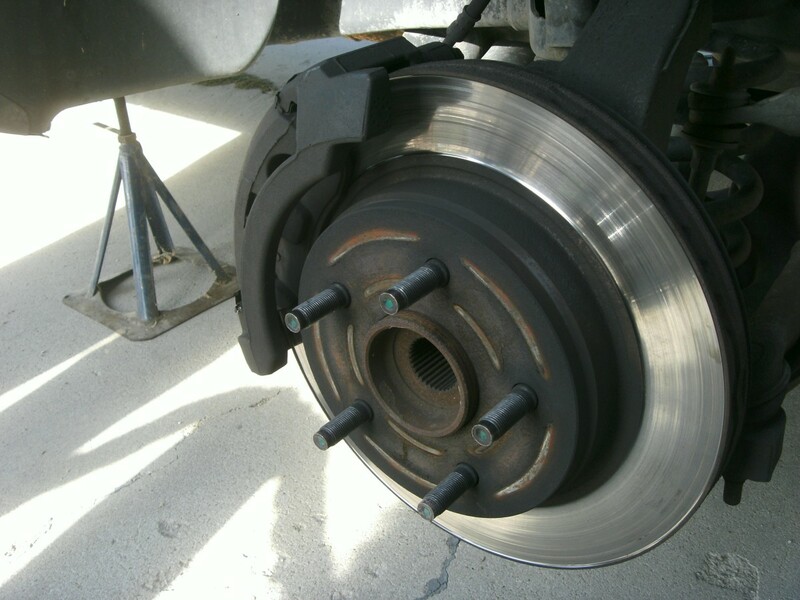 There comes a time in every car's life when the brake pads and/or rotors must be replaced. 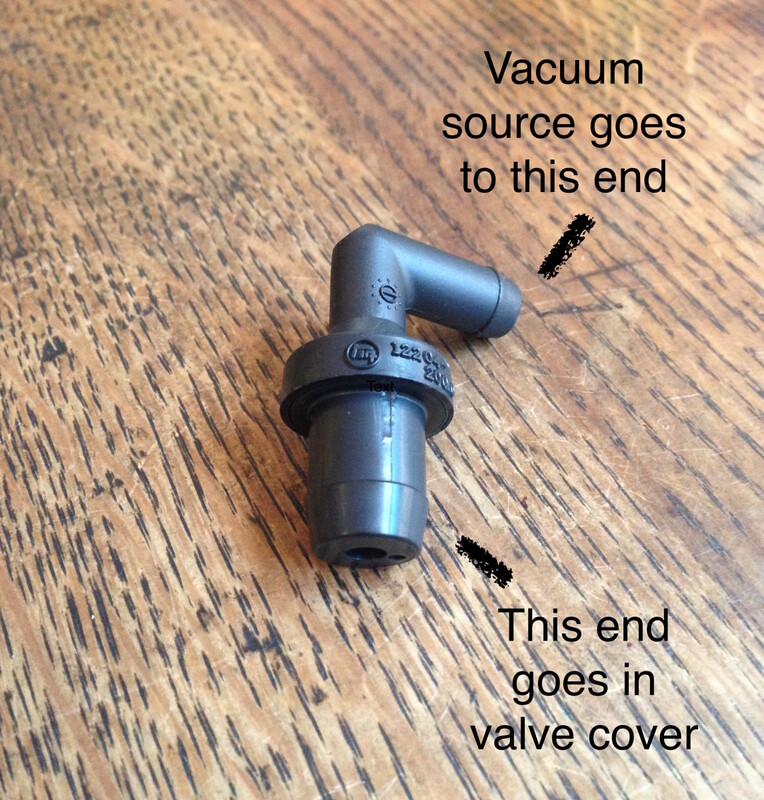 Typically, it is a fairly simple job to replace these parts—well within the capabilities of the home mechanic—very often saving hundreds of dollars for an hour's work. 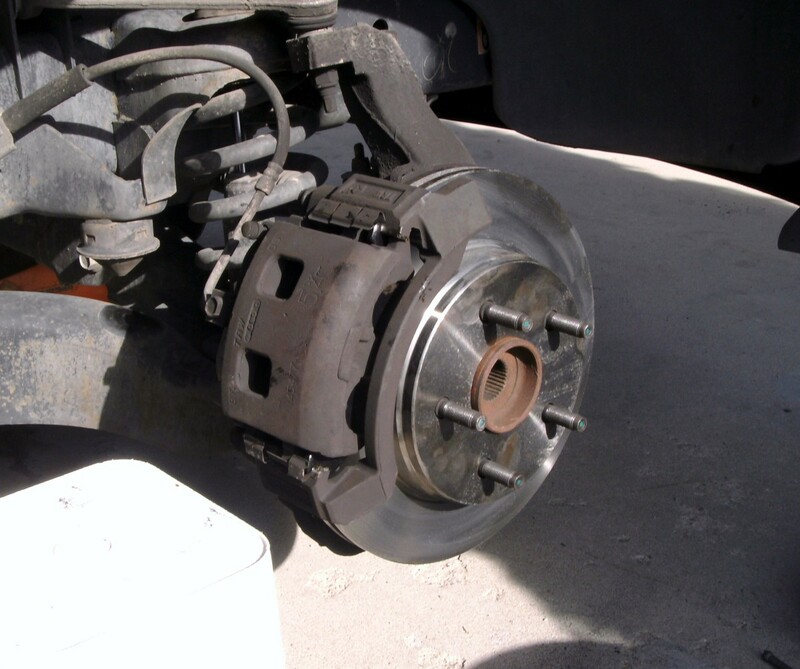 While this article is specific to the 2002 Dodge Ram 1500, the basics of changing either pads or rotors remain the same. 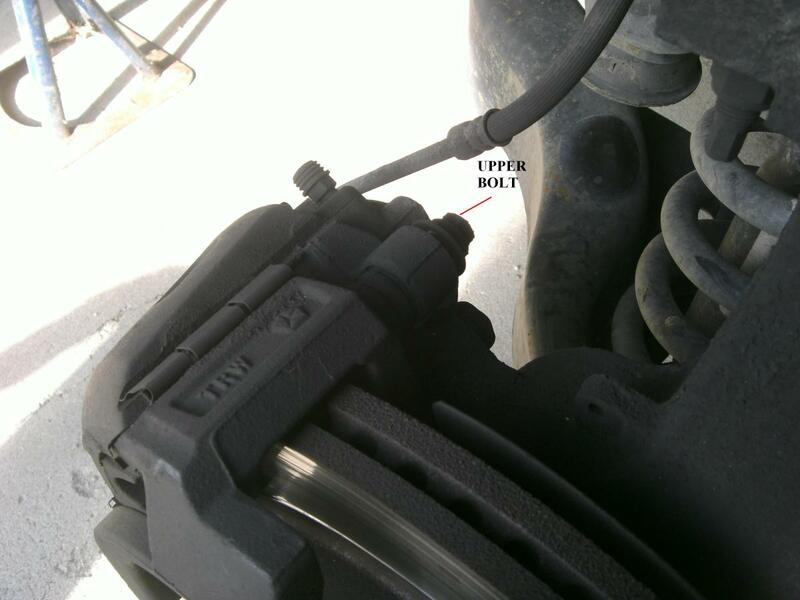 The location of bolts will change, and some vehicles may use other methods of holding pads in place (e.g., 4-wheel drive pickups may have to have the hub removed to change rotors), but this article can still be used for generic information as well as specific instructions on the Dodge pickup (with photos for reference). 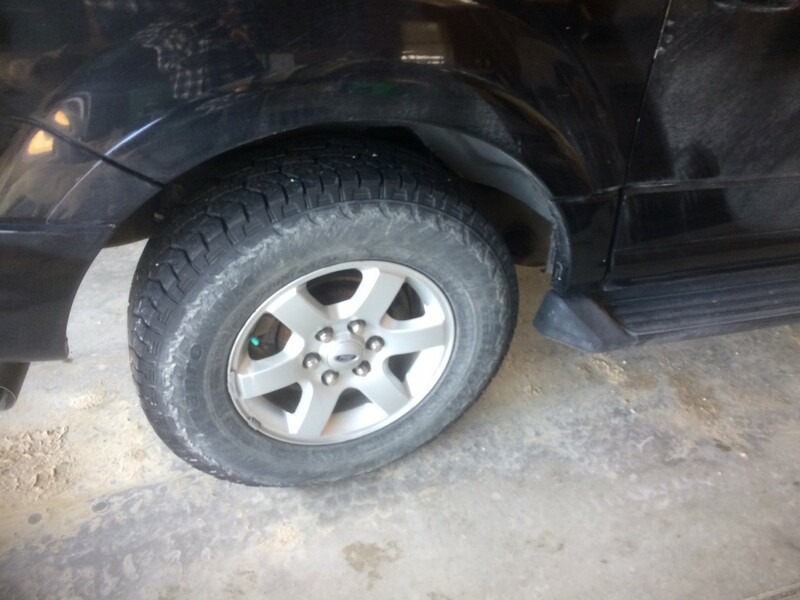 Begin by loosening the the bolts holding the wheel on, and raise the vehicle so that the tire is off the ground. 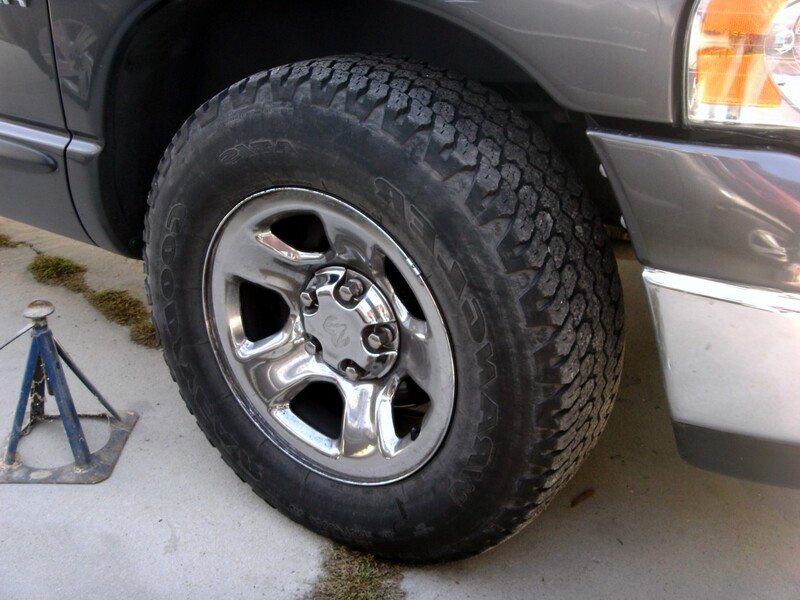 Use of a jack stand or other method of supporting the truck in the air is mandatory; never trust the jack to hold those thousands of pounds up while you are under the car. Remove the tire and wheel, exposing the brake rotors and calipers behind it. Carefully check the rotors for grooving or ridging; while the rotors were smooth enough on the truck used here, they had a deep ridge cut into them at the outside edge. Leaving this ridge in place will damage new pads fairly quickly, and the decision was made to replace both rotors as well as the pads. If the rotors are grooved to point that you can actually see the grooves the rotors will need to be replaced or turned at a machine shop. Very small grooves, barely detectable by running your finger over the rotor, are not a major concern, but anything deeper and the rotor again needs turned or replaced. There are two bolts on the back of the caliper assembly that hold it in place. Remove these bolts and work the caliper assembly out. Remove the disc pads from the rotor. 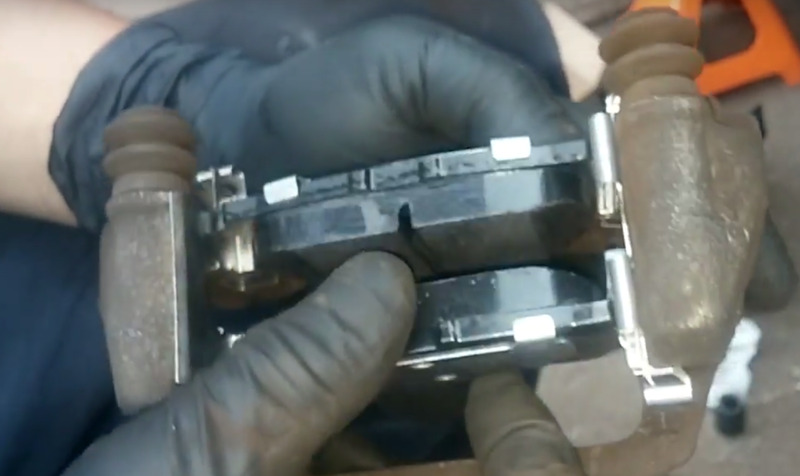 There is a small clip at the top and bottom of the opening where the pads came out; remove them. If the rotors are in good shape and are not to be replaced, clean the clips, lubricate them with brake grease and refit them into the place they came from. Replace the pads with new ones. The calipers must be compressed back into the assembly. 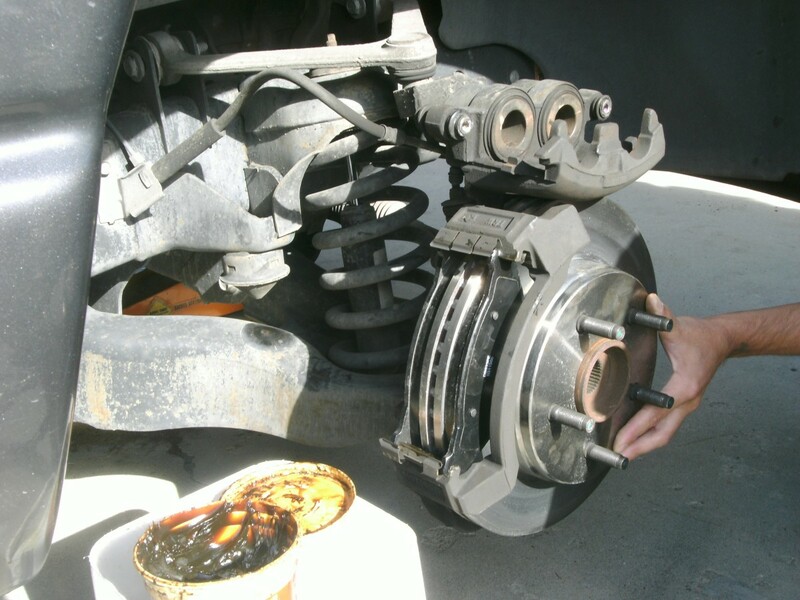 Using a C clamp or similar tool along with the old brake pad slowly compress the calipers. 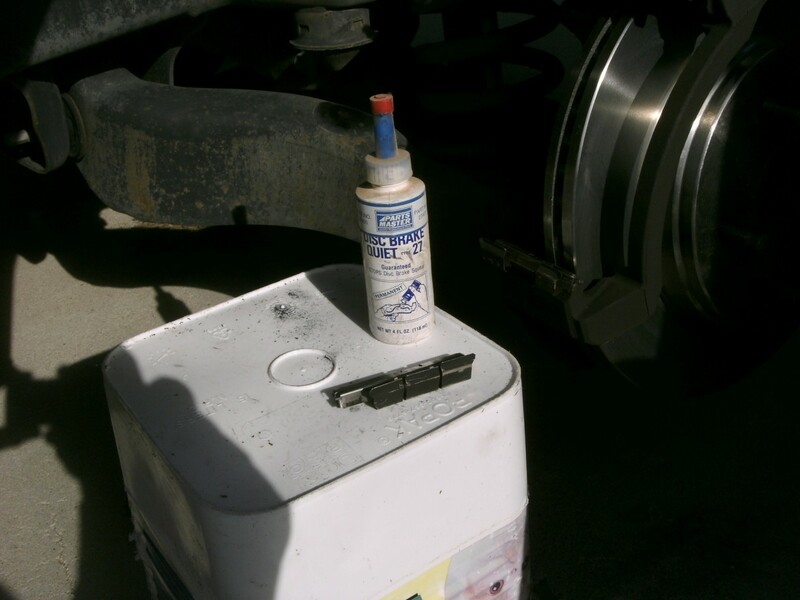 Open the brake fluid reservoir and make sure there is room in it for more fluid; compressing the calipers will result in fluid entering the reservoir. 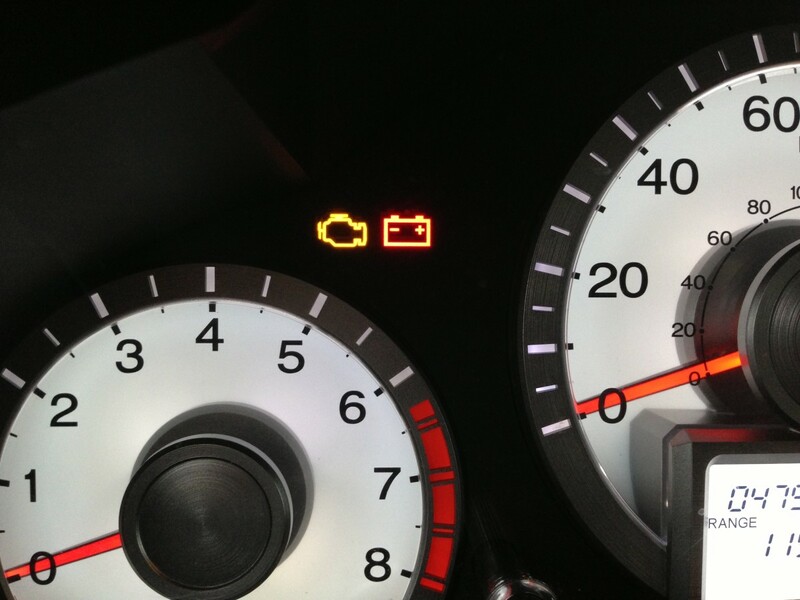 Check periodically to make sure it is not running over. If needed, a clean rag can be inserted into the reservoir soaking up some of the fluid and remove it. If this compression is not done, you won't be able to get the caliper assembly over the new pads. Fit the caliper assembly back into place, making sure the clips are placed correctly. Replace the tire and wheel, tighten the bolts and you're finished. 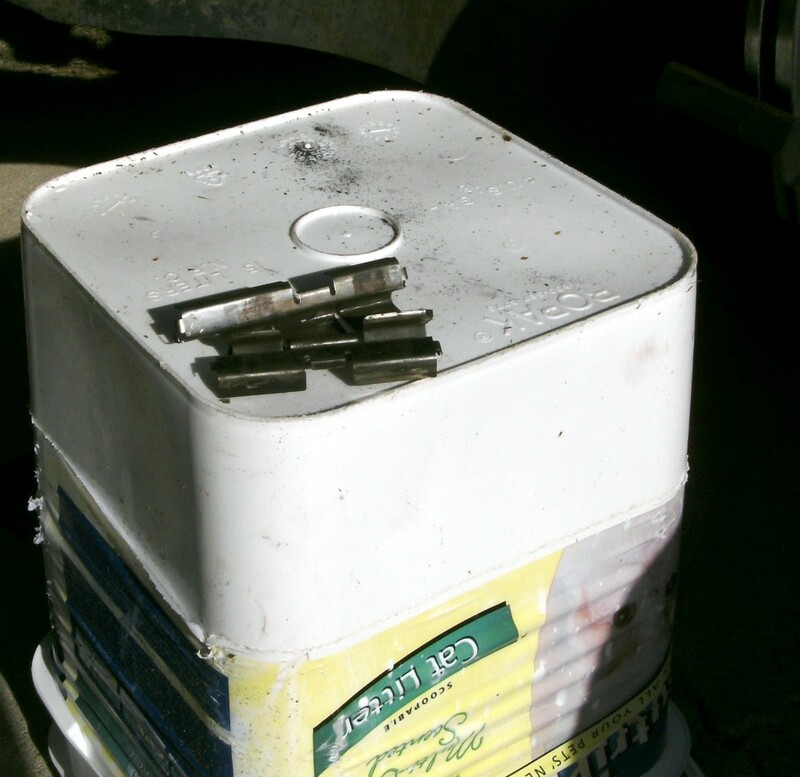 It is a good idea to use some lubricant (anti squeal) on the back side of the new pads to keep them quiet. This does not mean grease or oil; either one will destroy the new pads. Use a commercial product just for this purpose and follow the directions on the container. Location of the upper clip; the lower is in a similar position. The two clips have been removed and set aside for later use. 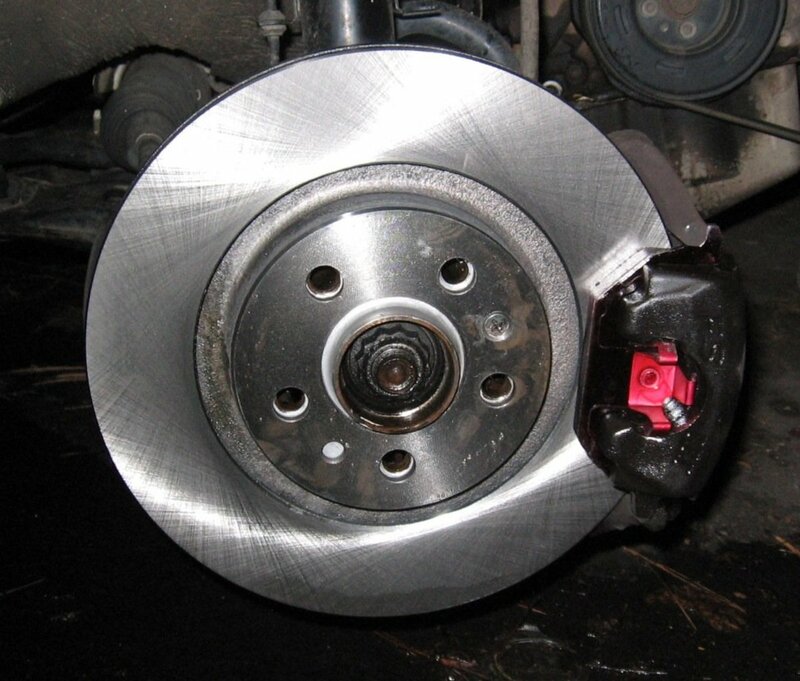 The calipers have been compressed as far as possible. New pads inserted into framework, ready for installation of caliper. Old and new disc pads. Not the difference in thickness. The old pads were very worn, well past the point of replacement. 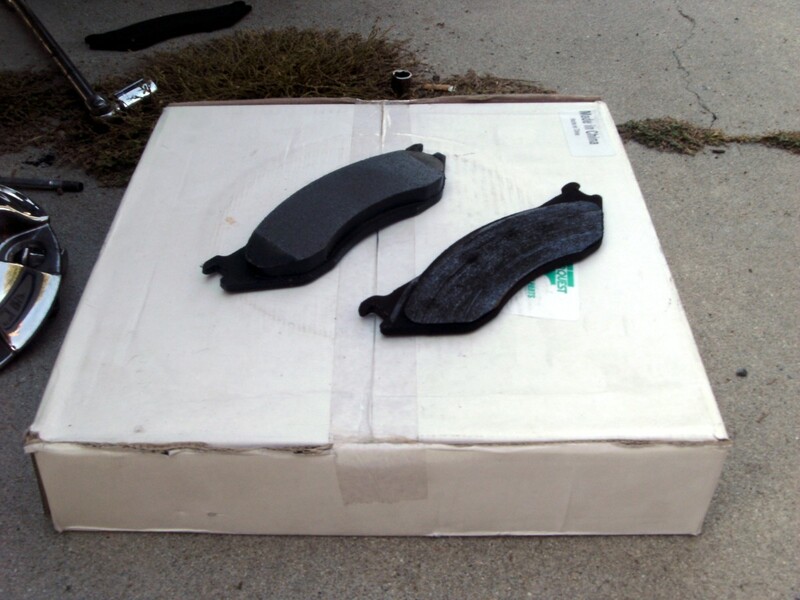 Commercial product to quieten brake squeal when changing brake pads. The clips holding the caliper assembly in place are also shown. 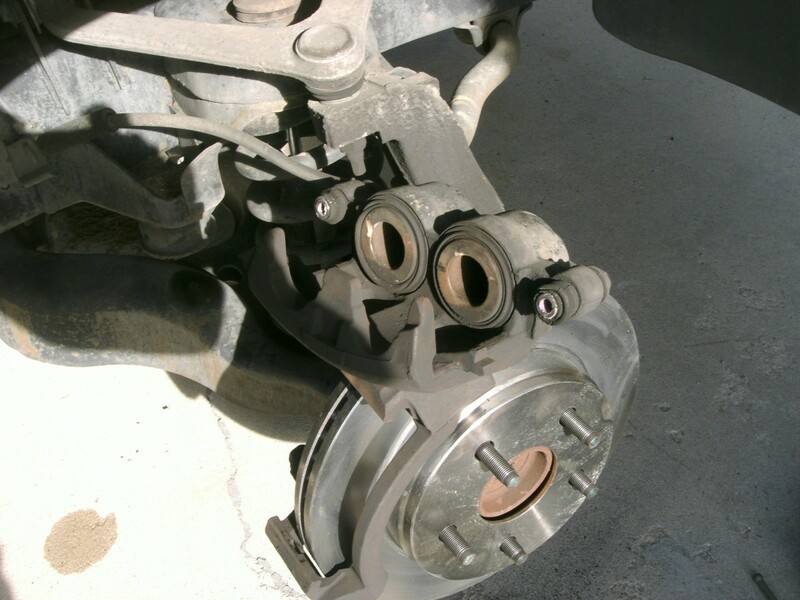 To replace the brake rotor, the caliper must be removed as in the preceding section, as well as the bracket that surrounds the caliper. With the caliper out, there are two bolts that hold the bracket in place; the photos show the location of these bolts. Usually quite tight, they will require considerable effort to remove; a ½" breaker bar and socket provides just the tool needed. Remove these two bolts and lift off the bracket. The rotor should easily slide off the lug bolts, just as if a tire was being changed. 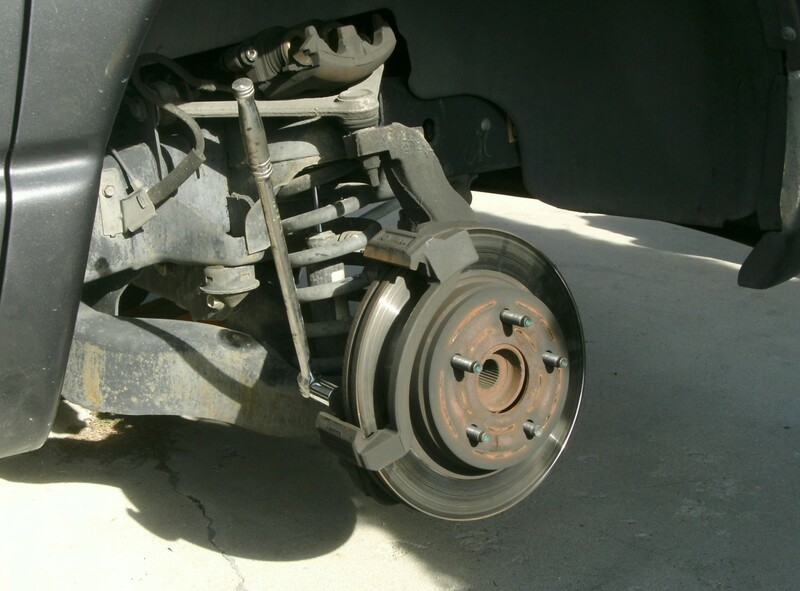 Occasionally it will be rusted in place and need to be tapped with a hammer; be careful not to damage the lug bolts. Slide the new rotor into place and replace the caliper mounting bracket. Refit new brake pads and caliper assembly per instructions above. Second view of the rotor and bracket that must be removed. Location of the upper bolt. 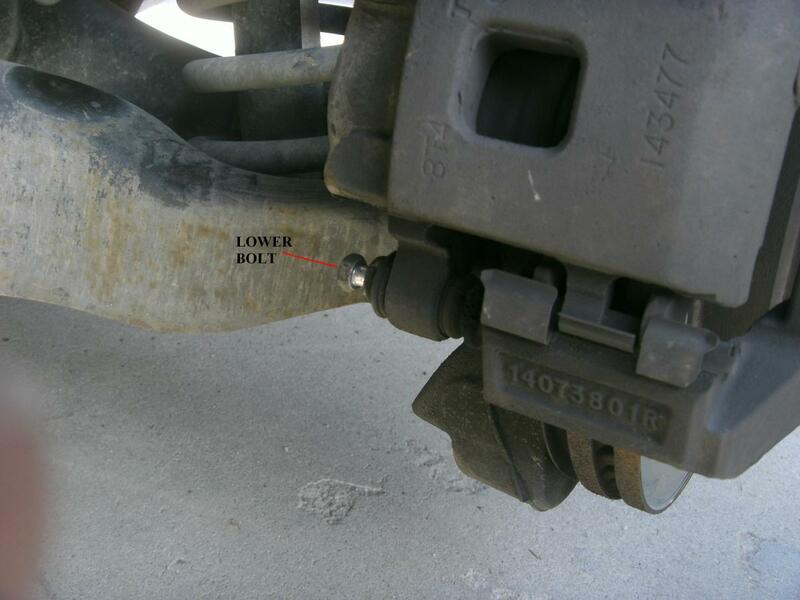 Lower bolt location. It has been partially removed to make it easier to see in the photo. Bracket has been removed and the rotor replaced with a new one. It slides over the same bolts that hold the wheel on. It is not a bad idea to go back and check the lug nuts. Easy to forget while the tire is off the ground, and you do not want them coming off while driving. A four wheel drive truck is not discussed; the biggest difference will be that the hub must be removed to change the rotors. 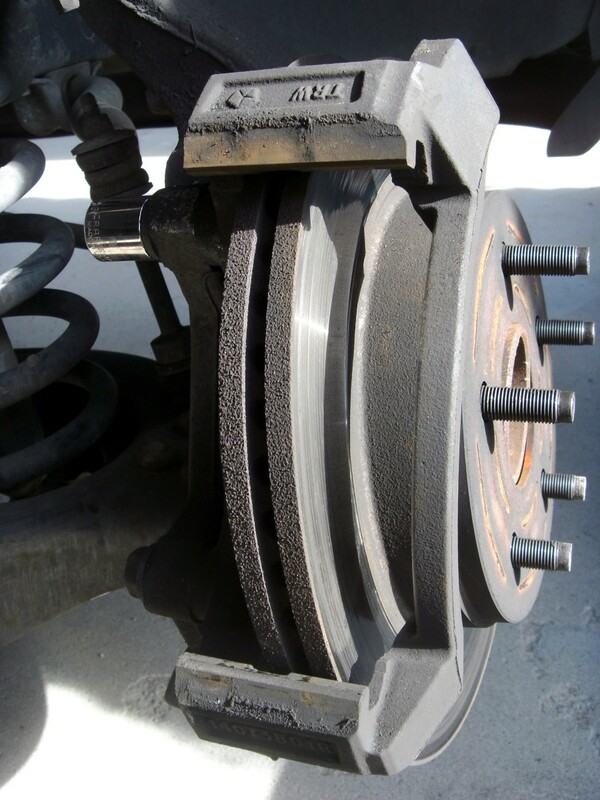 A new set of brake pads does not require this, and procedures will be the same for 2 or 4 wheel drive. 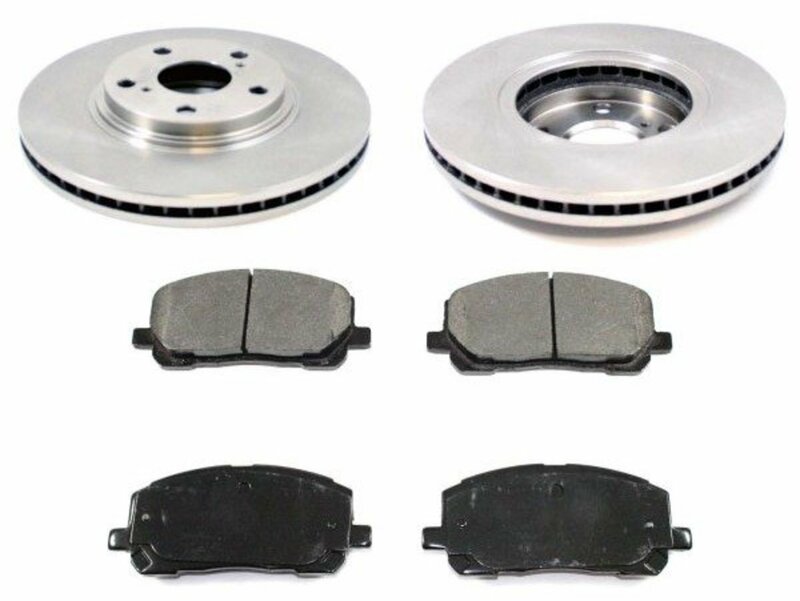 Brake pads and rotors are available from nearly auto parts store, but if one is not available these items are also available online. 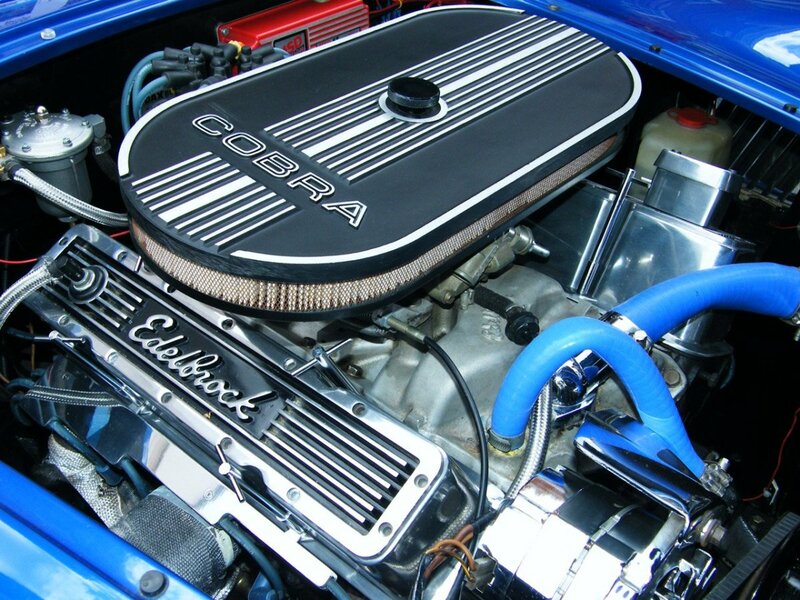 Typical information needed is the make, year and model of the car or truck, along with 2 or 4 wheel drive and engine size. 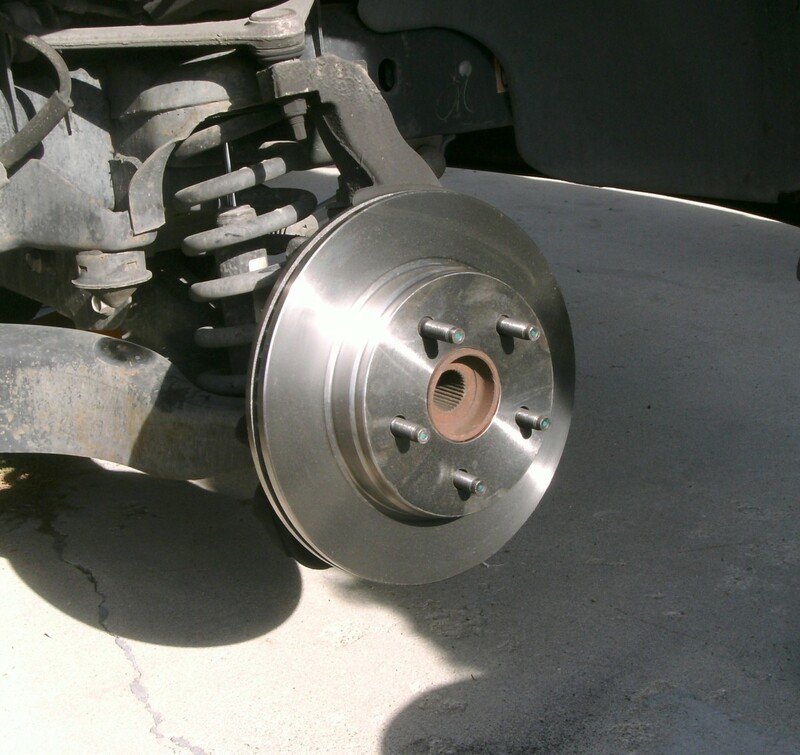 While examples are shown above for Amazon, it is left to the reader to search out the particular disc pads or rotors to purchase to replace worn ones on your vehicle. How do I take a rotary front disc off? 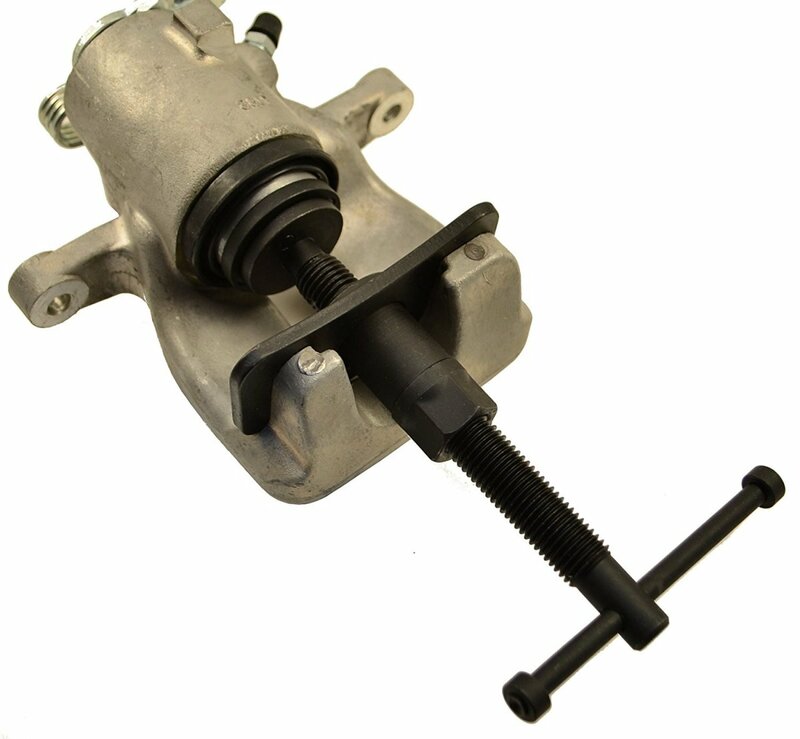 With the brake caliper removed, remove the two bolts on the brackets and slide the rotor off; it may need a little help by tapping with a hammer. Instructions for the procedure are in my article. I changed the rotor of my Dodge Ram 1500, and now when I come to a stop there is a noise coming from the wheel. What could it be? Maybe you picked up some dirt or sand when you installed the pads. Check to make sure that the pads installed correctly, and all the bolts are tight. Your are more than welcome. I assume you have (had) a project to do; I hope the hub helped out and you finished successfully. Thanks, Earnest, coming from you that means a lot. Yes, I think photos are a necessary addition to anything like this and won't write a hub about something I can't take pics of as I do the work. It's great that we can illustrate what we are trying to teach. 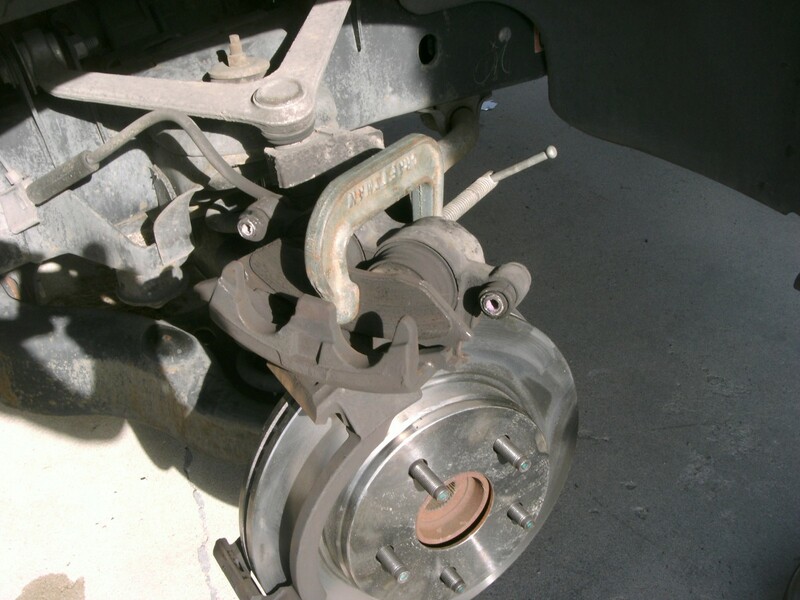 The pictures are great, and clearly show how someone can repair their brakes at home. Very useful addition to the car repair hubs here.